Bodicote is a village and civil parish about 2 miles (3 km) south of the centre of Banbury in Oxfordshire. The 2011 Census recorded the parish's population as 2,126. The Domesday Book of 1086 records a windmill that stood next to the grove at the top of Bodicote. Sor Brook, which forms the southern boundary of the parish, has a watermill. Bodicote House is a large Georgian house with a number of Victorian additions. It is now the main office for Cherwell District Council. The Church of England parish church of Saint John the Baptist has existed since at least the 13th century, and its chancel arch dates from that time. The building has north and south aisles linked to the nave by 14th century arcades of three bays each. There used to be a bell tower over the north aisle. In 1844 the architects John Plowman and H.J. Underwood effected an almost complete rebuilding of St John's that included demolishing the old tower and replacing it with the current west tower. The church is a Grade II* listed building. The tower has a ring of eight bells, all from the Whitechapel Bell Foundry. Thomas II Mears cast a ring of five bells (the present fourth, fifth, sixth, seventh and tenor bells) in 1843. The present treble, second and third bells were cast and hung in 1974, increasing the ring to eight. The tower has an iron-framed turret clock that was made by John Wise of London in 1700. The clock was renewed and modified in 1843, probably by Thomas Strange of Banbury. Bodicote Methodist church was built in 1845. Bodicote has a Church of England primary school. The village has two pubs: the Horse and Jockey and the Plough. It has also the Spice Room Indian restaurant, which used to be the Baker's Arms pub. It was built in 1702 and latterly was controlled by Mitchells & Butlers brewery. There are also a hairdressing salon and a post office. Bodicote Cricket Club plays in the South Northants Cricket League. Bodicote has a Women's Institute. Every year since 2000 a group of local volunteers has organised the Bodfest village festival on King's Field. The festival typically takes place in late July and early August and includes live bands, a pig roast and a barn dance. A plastic duck race and raffle are held each spring on the Sor Brook to raise funds for the festival. In the early 2000s the District Council's planning department put forward in its Local Plan plans to build a new housing estate on the College Fields adjoining Bodicote and the Cherwell Heights housing estate of Banbury. In February 2006 Cherwell District Council voted to approve the plans to meet a housing target despite a 20,000 signature petition against it. About 1,070 houses are being built along with local shops, a public house, a church, a restaurant, a school and other local services. Stagecoach in Oxfordshire bus route B2 runs hourly, Mondays to Saturdays, between Banbury and the centre of Bodicote village. There is no evening, Sunday or bank holiday service. Stagecoach in Oxfordshire route S4 serves the A4260 road along the eastern edge of Bodicote village. It runs half-hourly, Mondays to Fridays, between Banbury and Deddington via Adderbury. One S4 bus each hour continues to Oxford via Kidlington. 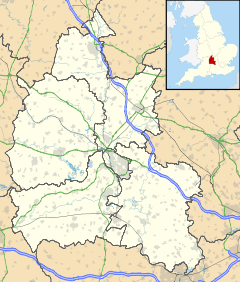 ^ "Area: Bodicote (Parish): Key Figures for 2011 Census: Key Statistics". Neighbourhood Statistics. Office for National Statistics. Retrieved 18 March 2015. ^ a b c d e Sherwood & Pevsner 1974, p. 483. ^ Historic England. "Church of St John the Baptist (Grade II*) (1277948)". National Heritage List for England. Retrieved 20 June 2017. ^ a b Chester, Mike (24 March 2007). "Bodicote S John Bapt". Dove's Guide for Church Bell Ringers. Central Council of Church Bell Ringers. Retrieved 27 March 2012. ^ a b Beeson & Simcock 1989, p. 32. ^ Historic England. "Baker's Arms public house (Grade II) (1248386)". National Heritage List for England. Retrieved 21 June 2017. ^ "Your nearest WI". Oxfordshire Federation of Women's Institutes. Archived from the original on 17 November 2015. Retrieved 18 March 2015. ^ "4 Housing sites". Banbury and North Cherwell Site Allocations Development Plan Document. Cherwell District Council. Archived from the original on 13 August 2011. ^ "The Masterplan" (PDF). College Fields, Banbury Design Code. Cherwell District Council. Archived from the original (PDF) on 22 July 2011. Beeson, CFC (1989) . Simcock, AV (ed.). Clockmaking in Oxfordshire 1400–1850 (3rd ed.). Oxford: Museum of the History of Science. p. 32. ISBN 0-903364-06-9. Sherwood, Jennifer; Pevsner, Nikolaus (1974). Oxfordshire. The Buildings of England. Harmondsworth: Penguin Books. p. 483. ISBN 0-14-071045-0. Wikimedia Commons has media related to Bodicote. Haval, Nikhilesh. "St John Baptist Bodicote". Oxfordshire Churches in 360 degrees. Nikreations.